An archeologist surveying the old cemetery opposite Hay Bay Church, which was built in 1792, is trying to pinpoint the burial places of nine teenagers who drowned in 1819 on their way to church. Sue Bazely and four workers also hope to determine where some of the area’s Methodist pioneers were buried. The survey is being done in connection with the church’s 200th anniversary celebrations last year. The Hay Bay board of trustees hopes to mark the last resting place of the young worshippers as well as any other graves that can be found. No cemetery records exist, but a few stones remain, and early books recall some of those buried there. The young people, whose tragic end was recorded in a lengthy poem published some years after the event in Napanee and area newspapers, were John and Jane German, Peter Bogart, Mary and Jane Detlor, Matilda Roblin, Betsy Clark, Huldah Madden and Mary Cole. It was a bright Sunday morning. Aug. 20, 1819, when 16 teenagers, set out from Casey’s point in a flatbottomed boat and headed for the chapel. The History of Lennox and Addington records that the boat began to leak as it neared the landing place and capsized, plunging the passengers into the water. The church service was in progress and the officiating clergyman had just prayed that “it might be a day long to be remembered,” when the congregation was startled by screams. Rushing from the church, they saw the teenagers floundering in the water. Of the 18, only nine were saved. During their excavations. 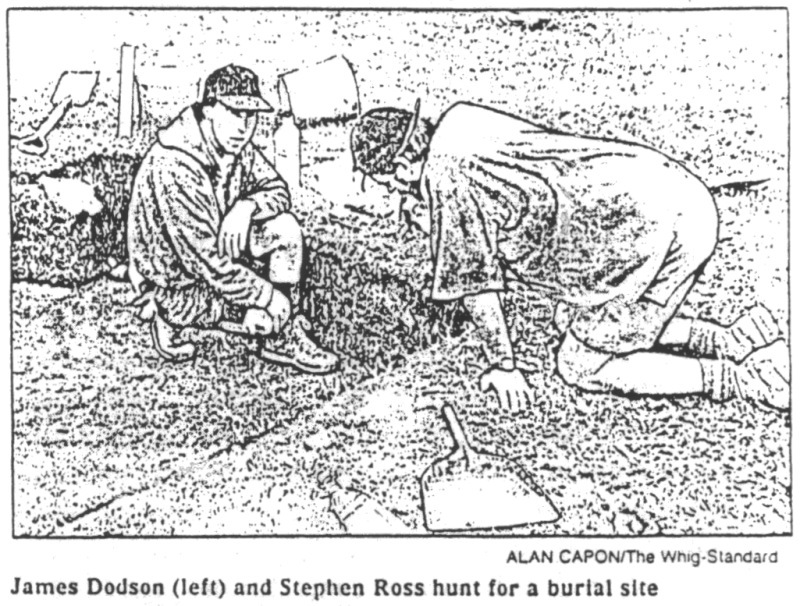 Ms. Basely and her colleagues have unearthed fieldstones that appear to have been shaped and placed at the head of graves.